Hockey’s getting back into the swing of things a little earlier this year with the return of the World Cup of Hockey, kicking off at Toronto’s Air Canada Centre on September 17th. Our crew already broke down each team’s uniforms when they were revealed back in March, but the masks are rolling out fast for the highly anticipated tournament, so let’s take a look at the North American teams. 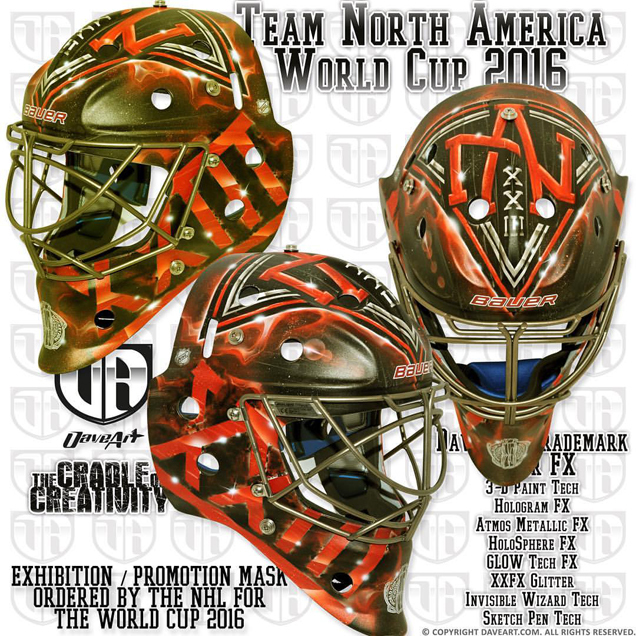 Rounding out team Canada’s collection of maple leaf-laden masks is Corey Crawford’s new bucket, painted by Steph Bergeron of Griffe Airbrush in Quebec. 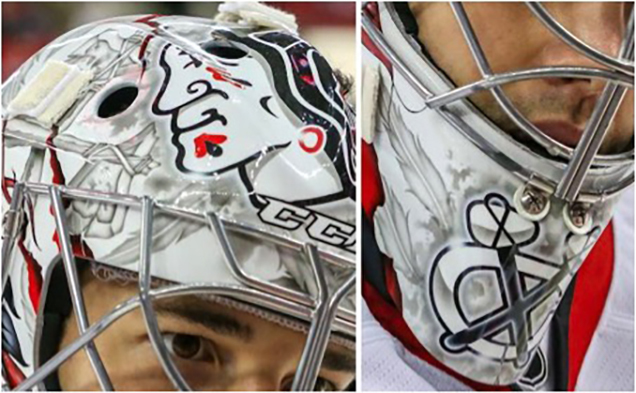 Not unlike Crow’s mask from the 2014 Olympics and recent Blackhawks mask, Bergeron took a monochromatic approach to the design, using all gray with red accents throughout the mask. Like Holtby’s and Price’s, Crawford’s design centers entirely around the maple leaf logo, although the addition of the leaf in the center of the netminder’s number 50 on the chin is a nice added touch to set his mask apart. My favorite part of this mask is definitely the red lacquer cage, as it’s the biggest distinguishing factor between Crawford’s and his teammates’. We’ve seen lacquered cages work beautifully in the past on retro designs like Brian Elliot’s throwback Blues bucket and Jaroslav Halak’s orange slimed cage. 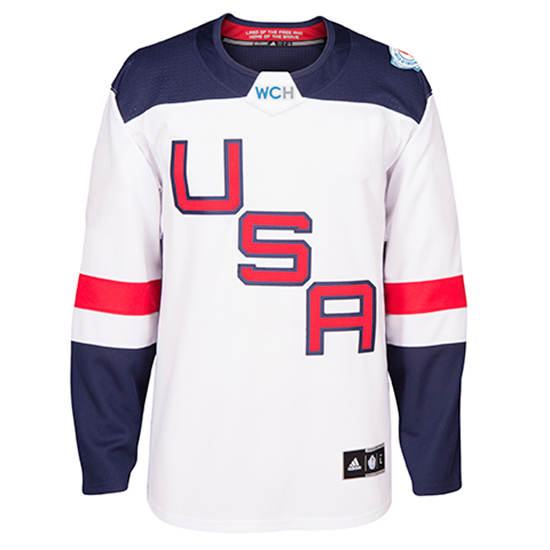 As Bergeron told InGoal Magazine, he and Crawford were aiming for a vintage aesthetic in this design too, and the patriotic outcome hits the nail right on the head. 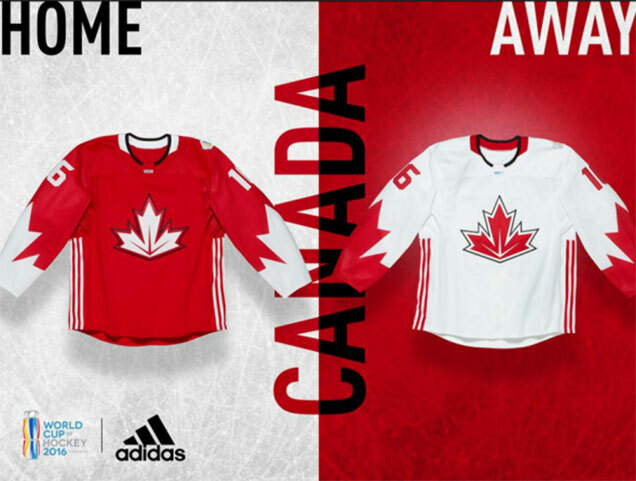 Adidas took a more modernized approach in interpreting the Canadian maple leaf for the team’s World Cup logo, and Dave Gunnarsson translated that beautifully onto the first of the Washington netminder’s two masks (left). The Capitals unveiled Holtby’s first bucket on Twitter, and I think it’s one of the best we’ve seen so far. The graphic, pointed veins in the leaf almost take on an abstract pattern of their own on the top center of this design. The red outlines surround a white cracked effect for the leaf itself, all set over a slightly darker red backdrop, letting the texture take center stage. The Capitals logo is subtly included behind the leaf using holographic paint, so faint that it’s only visible up close and from the proper angle. 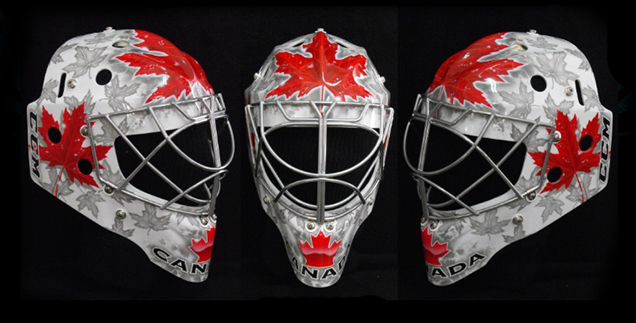 The white panel through the sides of the mask mimics the striping of the Canadian flag and is filled in with sketch pen drawings of the maple leaf, NHL and World Cup logos throughout. This mask keeps the perfect balance between graphic and detailed, something we’ve seen Gunnarsson do flawlessly time and time again. 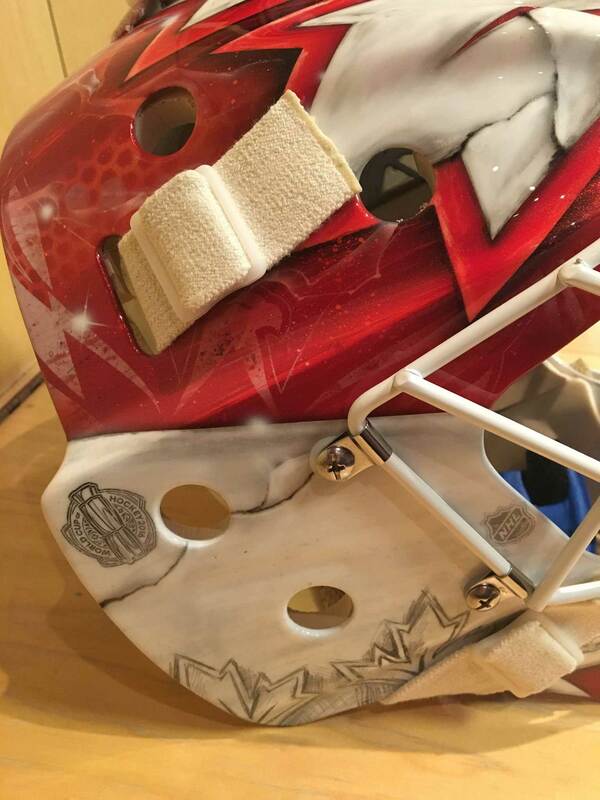 Aesthetically, the design isn’t much different from Holtby’s first mask, sticking with the red, white and gray color palette and using the maple leaf as the primary design element. Gunnarsson used the sketch pen technique in both, this time to recreate images of the band filling in the negative space. As reported by Scott Salmond, VP of Hockey Operations for Hockey Canada, Holts will auction off the mask after the tournament to raise money for Downie’s charity of choice. If goalie masks could come in pairs of good and evil siblings, those siblings would be Price’s two masks for the World Cup. As revealed by CCM, the Daveart creations each use the Canadian maple leaf silhouette as a repeated motif throughout the masks. These designs have a ton going on, so let’s first take a closer look at the evil sibling (right). Each of the almost symmetrical sides is adorned with a large maple leaf and smaller holographic leaves scattered throughout. Hidden behind the large leaves is “Canada” in black script and as an accent, red electric currents with subtle blue highlights cover both sides. 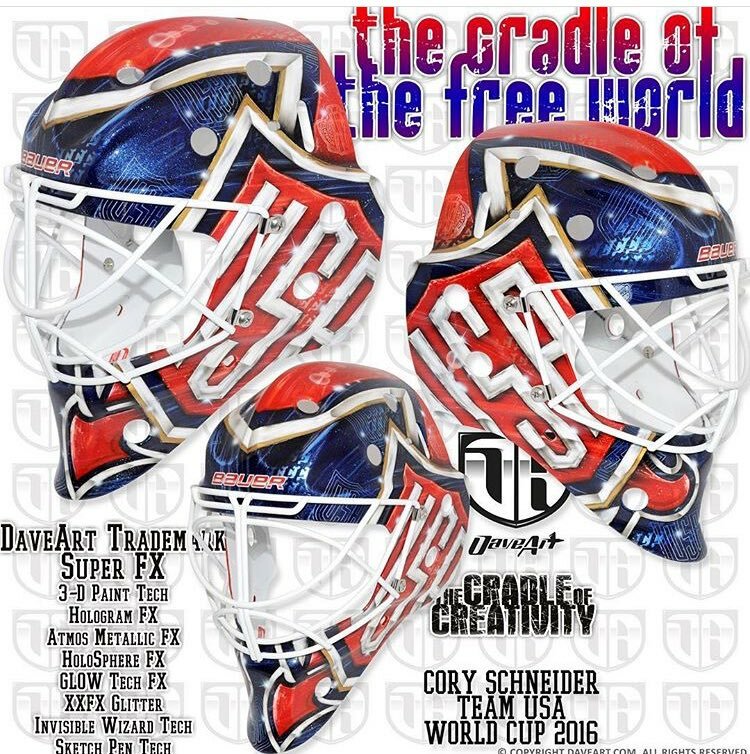 Price’s number 31 and small World Cup logos can be spotted hidden around the chin area, creating additional layers to this complex design. Completing the sinister feel is the dark pewter cage, blending flawlessly into the dark grays and blacks of the rest of the mask. This design is electric, evil and all around pretty badass. It’s extremely complex, but the black and gray color palette hold it all together and create a cohesive look. The lack of black in Canada’s jerseys makes the palette a slightly puzzling choice, but mask #2 falls more in line with the red and white. Almost identical to it’s sinister counterpart, mask #2 (left) is actually more in line with Holtby’s mask aesthetic-wise. Compositionally, this mask is the same as mask #1 but uses a patriotic red and white color palette instead. Small silhouettes of the Canada World Cup logo are stenciled in around the large maple leaves on each side that this time are painted in white, making them stand out from the red backdrop. 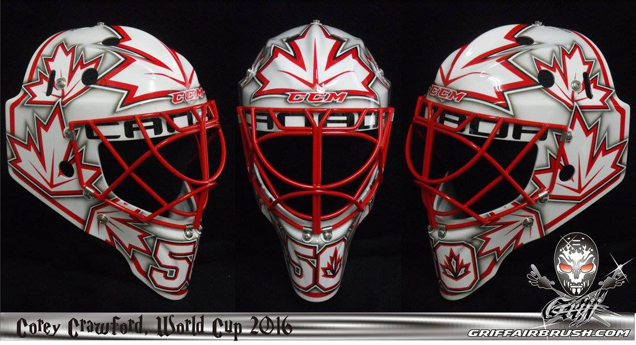 Mask #2 seems to coordinate better with Canada’s unis for the tournament, but evidently Price will have options to match his mood. 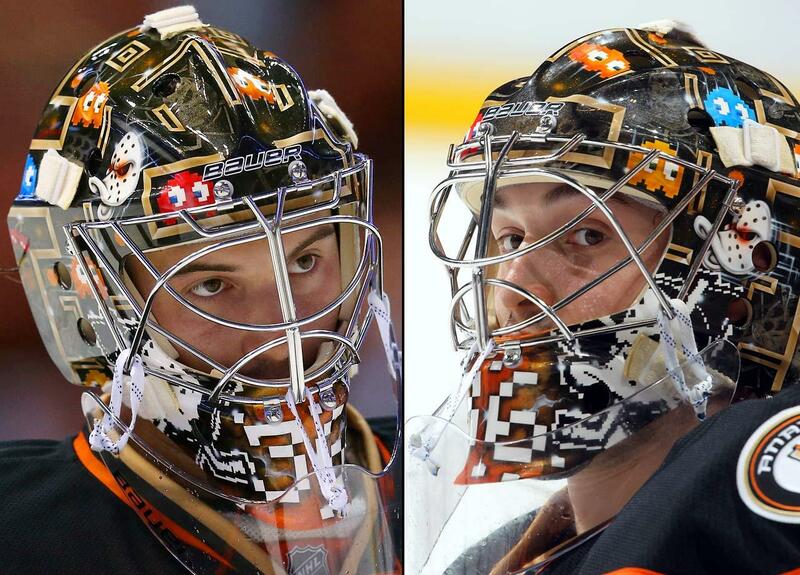 John Gibson’s so far short but successful career in Anaheim was highlighted not only by his play, but by his epic Pac Man mask. 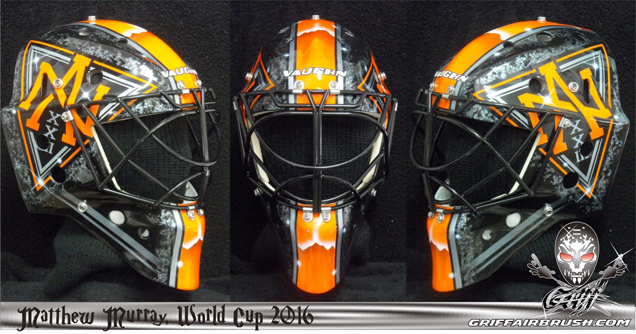 Painted by Dave Gunnarsson, Gibson’s World Cup mask thankfully carries on the 8-bit tradition. A child of the 90’s himself, Gibson’s mask perfectly captures the good ol’ days of arcade games with pixelated Mighty Ducks logos on the sides (further adding to the nostalgia factor) surrounded by 8-bit Pac Man ghosts. Even Gibson’s number 36 on the chin is so pixelated that it’s hardly legible at first glance. The only crisp lines on this mask come in the North America logo on top––the most prominent part of the mask––which stands out nicely because of the contrast in style. The simple red and black color palette helps ground this design and keeps it from going completely overboard. 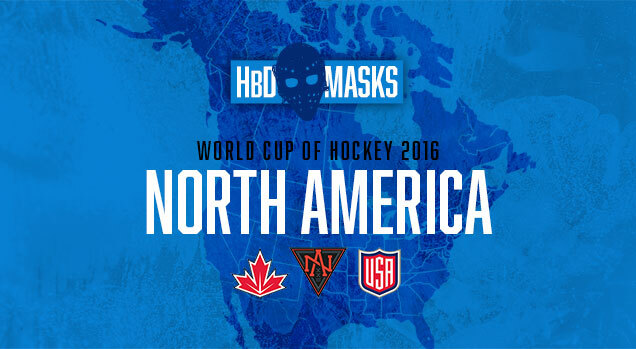 It may be early, as more masks are being revealed every day, but I’m placing my bets now on team North America for the best mask collection of the tournament. 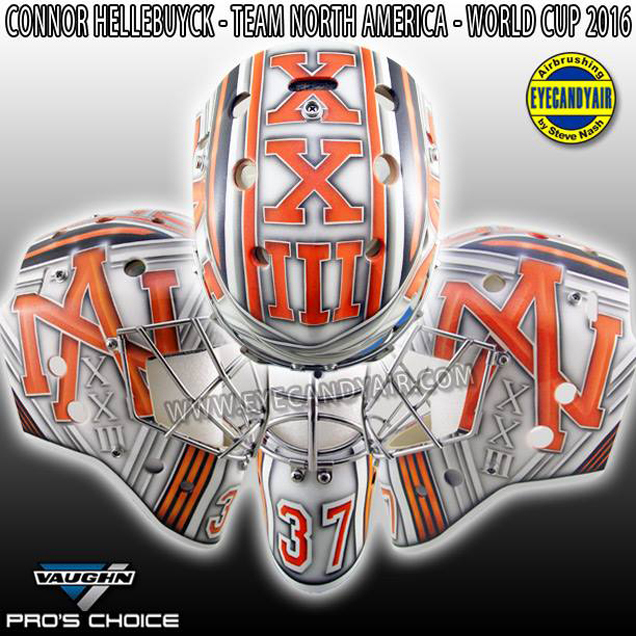 Rounding out the trio of North American youngster masks is Winnipeg goaltender Connor Hellebuyck’s. Heavily focusing on the roman numerals and NA monogram, the bold orange letters stand out on the otherwise muted design. More in line with teammate Murray’s mask than Gibson’s, Nash took a super minimal and clean approach to Hellebuyck’s bucket––no special effects needed here. The light gray background is only broken up by thin clusters of orange, white and black striping on the top, back and chin, plus the XXIII numerals on the top and side. Ice time may be hard to come by for Hellebuyck up against Gibson and Stanley Cup champ Matt Murray, but all three of these masks are really sharp and will look great on the ice. 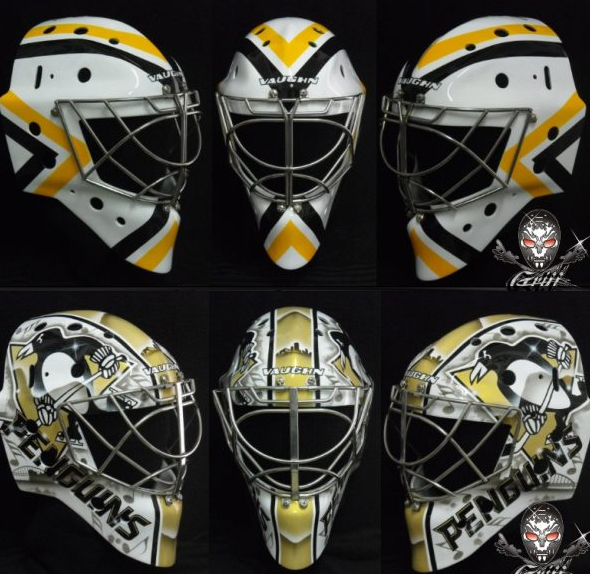 Revealed via Twitter on August 19th, the young Penguins’ netminder showed off his sleek new NA mask by Stephane Bergeron, and it’s metal AF. 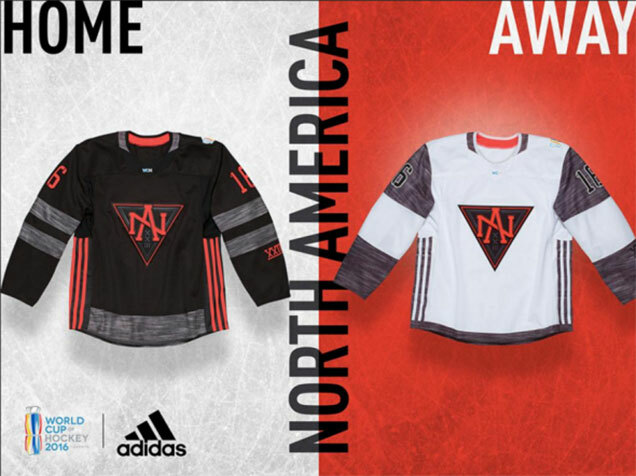 Murray wouldn’t be the first to use a heavy inspiration for his bucket, but as a member of Team North America for the World Cup tournament, the dark and badass style was already decided for him by the good people of Adidas. The under-23 squad’s jerseys are less than appealing with the duct tape gray bands along the bottom and orange accents, but given that this sinister look is what Adidas branded the team of youngsters with, this mask fits the bill pretty nicely. 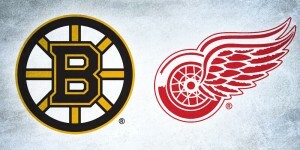 Like Murray’s 2015-16 Pittsburgh masks, Bergeron took a graphic, organized approach with a bold stripe down the center and logos on each side. The real interest in this mask though comes from the creative textures added throughout. 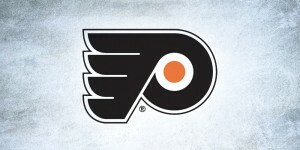 The orange in the center has a glossy, electric feeling, while the negative space around the logos has a shiny gray texture similar to the heathered gray on the jerseys. 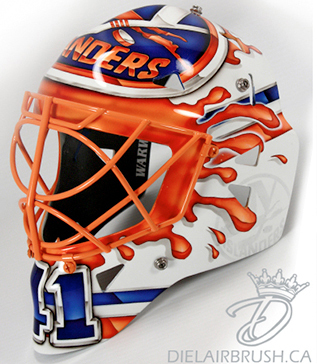 Murray will likely see a good amount of ice time, playing alongside Anaheim’s John Gibson and Winnipeg’s Connor Hellebuyck, so look out for this mask to hit the ice in September. 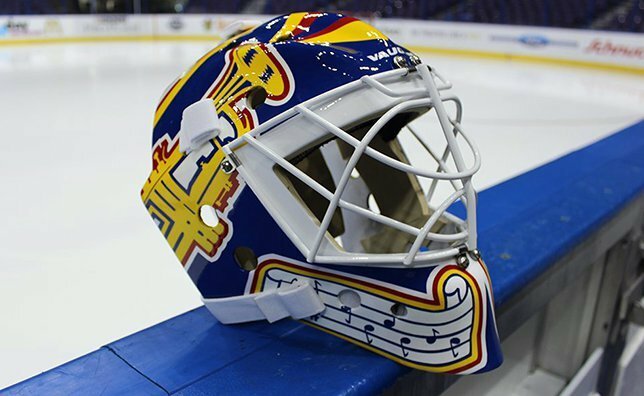 While no one is actually wearing this mask on the ice, prolific artist Dave Gunnarsson was commissioned to create generic promotional masks for each of the teams in the World Cup tournament. Having the freedom to work client-free, the door was open for Gunnarsson to create whatever he wanted. 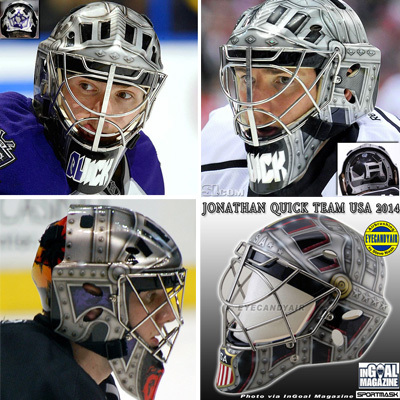 With the opportunity to give each team its own personality and style, the North America mask is very much in line with the hard, metal aesthetic of each of its’ three goaltenders’ masks. The roman numeral XXIII runs prominently down each side with the full team logo on the top of the mask over a smoking, flaming red background. With no name or number to include, Gunnarsson added the World Cup logo on the chin in white paint. The texture and metallic effects in this mask are really nice, and without the worries of coordinating with jerseys or reading well on the ice, the creative freedom really let Gunnarsson’s artistic talent shine. Possibly the most highly anticipated mask of the World Cup was ironically the first to be revealed in our 2015 Bucket Bracket Challenge champion, Ben Bishop. Painted once again by prolific artist Dave Gunnarsson of Daveart, Bishop took his now signature glow-in-the-dark Tron motif to patriotic heights with a USA-meets-Lightning design for the tournament. 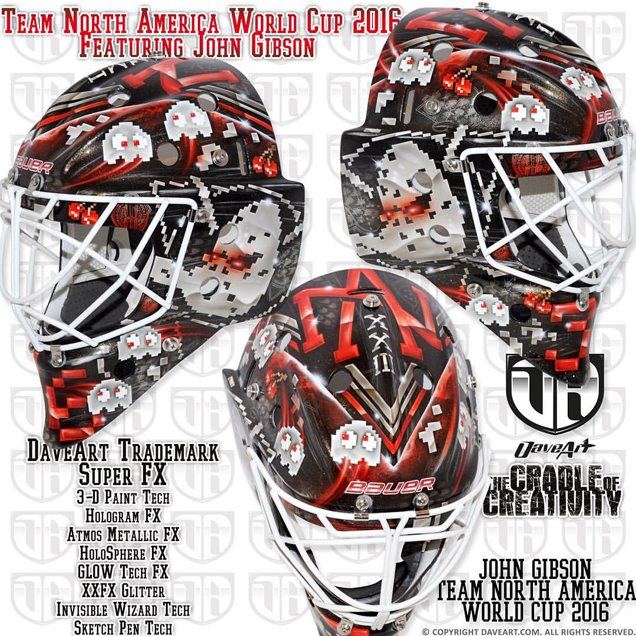 Bishop first unveiled the mask on Twitter with a video displaying the mask in light and dark settings, the USA crest displayed prominently on the top with electric currents surrounding the logo. 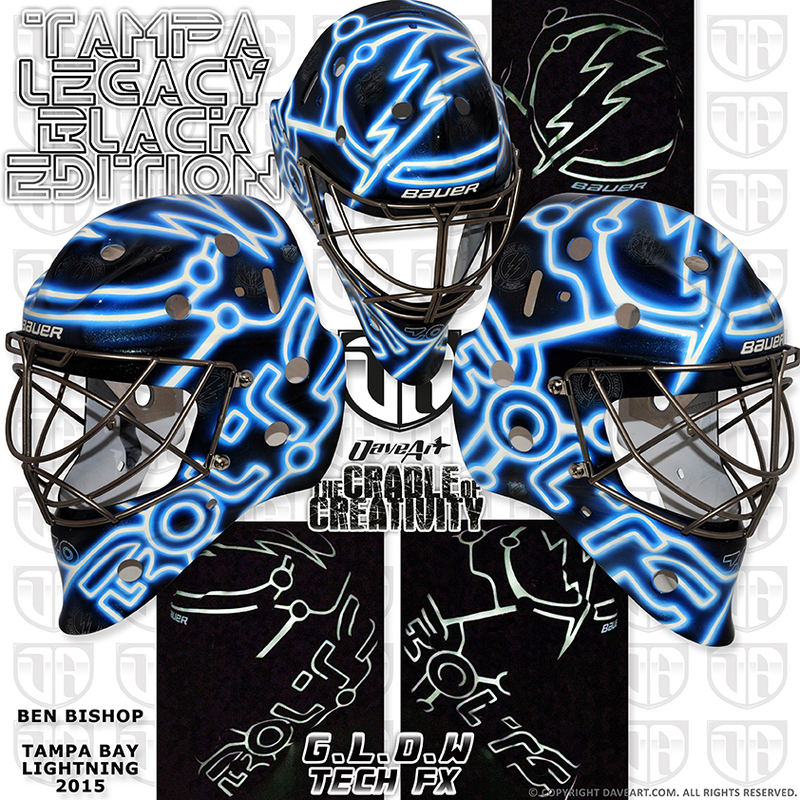 The neon tubing, where Bishop’s mask typically says “Bolts,” spells out “USA” on each side over a matte blue backdrop. 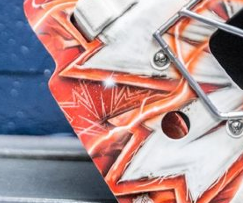 The details in this mask are all holographic, with tiny, layered USA and Lightning logos dispersed throughout and World Cup logos on the back sides. When the lights go out, (still, let’s hope that doesn’t happen. I speak from personal experience when I say that hockey games in the dark are no fun) the neon tubing and USA logo are all that remain. It’s still undecided whether Bishop, Jonathan Quick or Cory Schneider will get the start for Team USA in net, but we at least know that Bishop will be glowing from somewhere inside the rink. 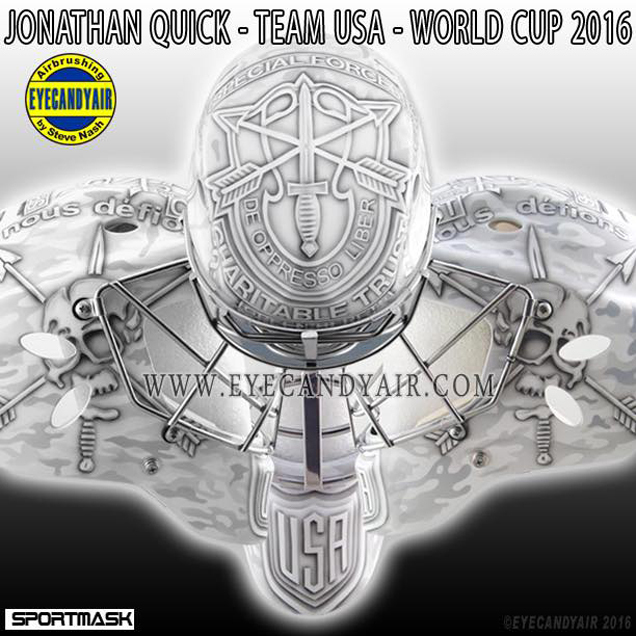 Straying for the first time from his battle armor motif, Quick’s World Cup mask is a quiet tribute to those who serve our country. 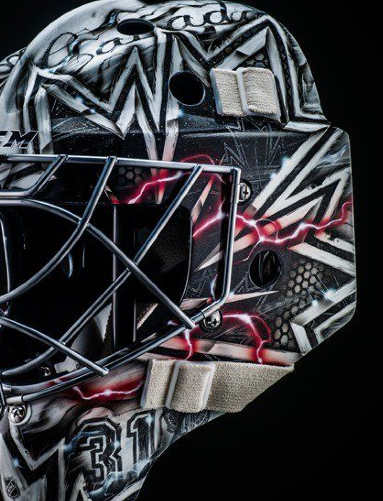 The Kings goaltender revealed the mask on Twitter, giving a special shoutout to artist Steve Nash and his military collaborators. Unfortunately with masks like this, the light gray and lack of contrast often get lost on the ice, particularly when paired with road jerseys. The sentiment behind this mask and the real military collaboration is extremely nice to see. Although the only explicit reference to team USA on the mask is the shield logo on the chin, every element in here is patriotic through and through, so bravo to Nash and Quick on this one. The Team USA shield is the most prominent piece of this design, placed on an angle with light flares and gold trim on each side. 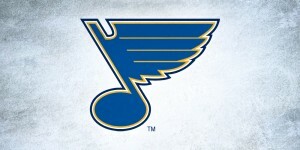 The red, blue, white and gold stripes are repeated on the top of the mask, coming to a point in the center. Underneath each shield, pieces of the Devils logo peek out around the chin, giving a subtle nod to Schneider’s NHL club. Silhouettes of the New Jersey logo are also scattered throughout the mask, creating holographic patterns in different locations. Layered on top are outlines of the USA shield, that give a collage-like effect over the entire mask. Like in Bishop’s the vibrant colors in this mask are really what make it so nice. It has a little bit of a metallic effect in the blue areas which border on being distracting, but the overall design has a good sense of visual hierarchy to still keep it balanced and well-composed.